“It only makes sense to study geography alongside history. In history, we learn about time, places, and people. Geography covers the places part.” I’d like to tell you that we’ve been studying this way throughout our homeschool journey, but I can not. It’s more likely that we are just above the “less than one-third of elementary and high school students showed proficiency in geography,” as reported by the U.S. Education Department. Children in America do not spend the time learning the lay of the land. They do not recognize where a country is on a map, and certainly can’t identify the black outline of most countries. Many do not know where the States of The Union are in relationship to one another. If this isn’t sad enough, as cell phones and GPS systems become more available, students are not even developing map reading skills. We like to travel by car. We enjoy hiking and exploring nature, and kayaking on the lake; so, we’ve taught our children how to read a map. They know how to follow directions, understand North, South, East and West; can calculate distance and recognize terrain, etc. In our house, learning the names of our States, their black outlines, where they’re located, and the name of their capital city, is a common occurrence, along with the memorization of the names of the Presidents of the United States, and the recitation of the 66 Books of The Bible, among other things, but not in connection to our history. This would be the reason we might fall outside the statistical average. Our World Geography knowledge is poor, but I’m steadily working toward changing that, with the assistance of Knowledge Quest and their Map Trek collection of historical outline maps. Map Trek maps are in chronological sequence; so, they can be used in conjunction with any chronological history program. There is also specific curricula that is complimented by the use of Map Trek – TruthQuest History, Tapestry of Grace, Sonlight Curriculum, Mystery of History, Living Books, and Ambleside Online, to name a few. Free Curriculum Integration Guides are available. There are full-color teacher maps, black outline maps, and reproducible student maps, available. It is recommended that map study be added to a curriculum, once or twice a week. Since we are just building our map-study-habit, we chose to use the maps just once a week. The maps and activities are broken down into three categories; covering grades K – 12. I chose the U.S. Edition; printing maps from our birth states and becoming familiar with their facts, even though our long term goal is to improve our World geography knowledge. The best map work is fun and interactive, and that makes Map Trek one of the best! 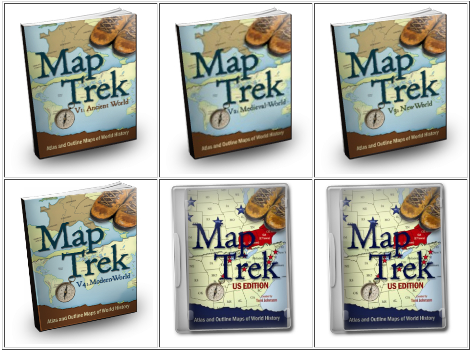 Individual Map Trek Editions for The World are $14.95, with the U.S. Editions being $19.95 in e-book format. The complete set of 6 e-books is $47.00, and the beautifully bound, over-sized, hard cover book, with a CD-Rom of reproducible student maps is $55.00. I hope you will utilize the links I’ve provided to visit Knowledge Quest’s website for more information. You can also read the opinions shared by my Crew mates, when you click on the banner below. Disclaimer* An e-book set of this product was given to me, free of charge, in exchange for my honest review, as a member of the Schoolhouse Review Crew. I receive no other compensation for my reviews on this blog. The opinions expressed are my own. I appreciate your viewpoint and your comments.